Ben & Jerry's releases new Empower Mint ice cream to highlight and support their efforts against recent laws restricting voting rights. The launch of the flavor also kicks off their year-long "Democracy Is In Your Hands" campaign to increase voter registration and participation. The new flavor features peppermint ice cream with fudge brownies and fudge swirls. According to the brand, "This fudge-filled flavor reflects our belief that voting gives everyone a taste of empowerment, & that an election should be more "by the people" and less "buy the people." 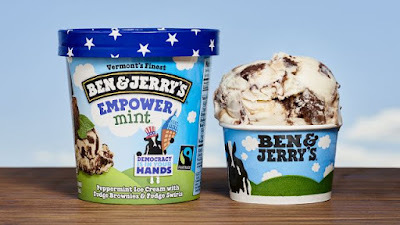 Empower Mint is available in pints in retails stores as a Limited Batch flavor and can also be found in Ben & Jerry's scoop shops. You can learn more about Ben & Jerry's "Democracy Is in Your Hands" campaign on their website here.